SIMON Goosey’s voice was so gravelly you suspected he ate barbed wire for breakfast. “I’m so proud of you boys,’’ the coach rasped, prompting another burst of applause for the Frankston players from supporters packed into the changerooms at Casey Fields. “The Goose’’ was hoarse after an afternoon hollering in the box and then, more pleasurable, singing the club song. The Dolphins have had some frustrating days this season, dropping matches they ought have won. But their performance against the Casey Scorpions on Saturday could salve a few wounds from the earlier rounds and was a reminder of their talent and tenacity. FRANKSTON Football Club president John Barry says the Dolphins at a delicate stage in their existence. Struggling on and off the field, Frankston is in need of help, Barry insists. Bendigo Gold announced last Wednesday that it would fold at the end of the season, unable to afford to continue as costs rise to field a stand-alone club in the VFL. Barry said Frankston, more than any other time in its history, needed support. He said once the new function centre, construction of which begins in a few weeks, was built the club will “make good money’’. “It’s just holding on ’till then,’’ he said. Barry said the Dolphins needed three things. “We need support. We’ve still got supporter base even though we are losing,’’ he said. 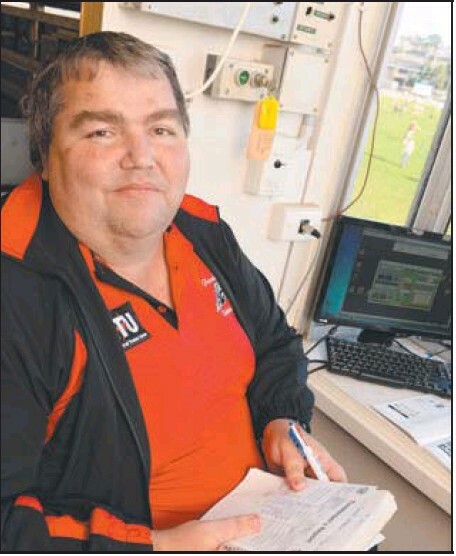 TICKING along nicely, Frankston Dolphins timekeeper Michael Robinson officiated in his 200th VFL game last Friday. He still laughs about the day at Visy Park in 2010 when the siren and emergency siren refused to work and he had to take extraordinary measures. “We ended up sitting in the Northern Bullants’ vicepresident’s car honking the horn,’’ Robinson chuckled. “The car was driven into the driveway in between the two stands and we just sat in the car. “Originally we sat in Bryan Mace’s van and then at half-time the vice president came over and we used his car because it had a louder horn. It had comfy seats.’’ Robinson said being a timekeeper had a serious side – “concentration is the key’’ – but it was also a fun job. “We have a lot of fun up in the box during the day. It’s not all serious,’’ he said. He said he especially enjoyed working alongside of the timekeepers from Port Melbourne, Sandringham and Williamstown. In his time at Frankston, Robinson said his top five Dolphins were Daniel Clarke, Michael Hibberd, Paul Kennedy, Aaron Edwards and Mark Baguley. 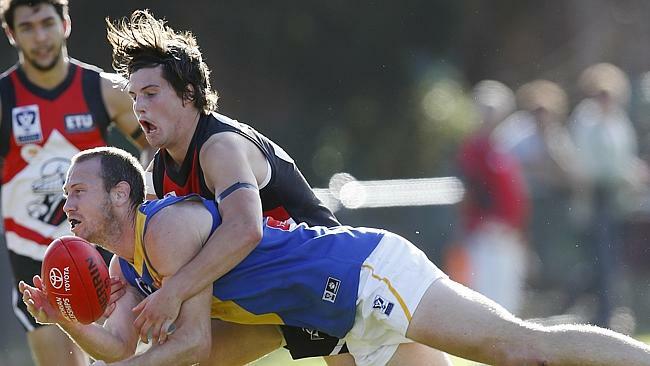 FRANKSTON'S latest recruit has come a long way to play in the VFL - all the way from Jacksonville, Florida. Alex Starling, who was scouted by the Sydney Swans two years ago, arrived in Melbourne on Saturday, being collected at Tullamarine by Dolphins coach Simon Goosey and assistant Bob Keddie. Starling, 24, 196cm and 93kg, is a college basketballer who was signed by the Swans in 2012 under the international scholarship scheme. But a stress fracture of the leg prevented them from listing him as an international rookie this year. However the injury hasn't extinguished Starling's dream of playing football. IN THE end it was inevitable. The moment a head count was called early in the third quarter and Frankston was found to have 19 players on the field; the Dolphins’ fate was sealed, writes David O’Neill. Under AFL Laws of the game - rule 5.5, that stipulates a team will have its score reduced to zero if found with an extra player on the field, the host’s were never realistically in the hunt for the four points in Round 14 the Peter Jackson VFL. The Dolphins were 5.8 (38) when the drama unfolded, leaving the three goals and five behinds they managed after the incident as their final score. The change sees the Roosters’ winning margin altered from three points to 41 points, a handy percentage boost for a side sitting just outside the top eight. But with most in attendance – including both playing groups – unaware of such a rule, the absorbing contest was left to run its path. And what a contest it turned out to be.